NYC, 02/24/2019, 5:00PM. Bach Vespers. 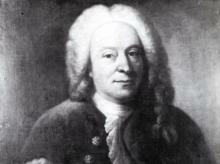 Composer George Christoph Bach was the elder brother of Johann Sebastian Bach's father Johann Ambrosius Bach. His most well known work is Siehe, wie fein und lieblich ist es for two tenors, bass, violin, three gambas and continuo. It was composed on his 47th birthday and a visit to Schweinfurt by his two younger twin brothers.